After a string of high-budget blockbusters, including Tintin, Mission Impossible: Ghost Protocol and the just-wrapped Star Trek 2, Simon Pegg is back in a low-budget British film. In A Fantastic Fear of Everything, he plays Jack, a paranoid children’s book author convinced that a murderer waits behind every door, and haunted by his suppressed childhood and visions of his loathed and most popular creation, Harold the Hedgehog. 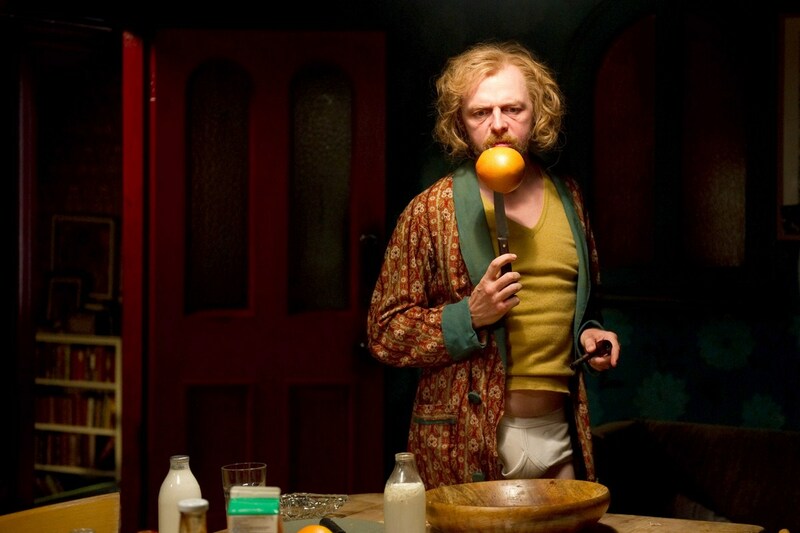 A funny, peculiar, very British film, it’s also the directorial debut of former Kula Shaker singer Crispian Mills (Look out for our interview with Crispian in the next issue). Out in cinemas next week, we spoke to Simon in a roundtable discussion about his involvement in the film, acting in his underwear, and working in America. How long did you actually have to spend in your underwear? The shoot was 28 days and my pant-work was five days I’d say, max. I was very happy to go to work in my underpants. I’m sure anyone who could, would. Everyone was used to it by the time I’d done my first day’s shoot. I’d just be sitting around on my little deckchair and nobody batted an eyelid. 28 days sounds ridiculously short. Considering I’d come off a shoot that was seven months, it was quick. But that’s unsupervised filmmaking for you. How did you first come on board? Crispian brought me a version of the script which was a direct adaptation of Bruce Robinson’s novella Paranoia in the Launderette, and it was a very funny, artful, interesting script and I liked it a lot, but it was probably only a short film in terms of its size. There isn’t really a platform for short films at the moment, sadly. I said if you could flesh this out it’d be something I’d be really interested in getting involved in because I loved his writing. Through a process of evolution it because A Fantastic Fear of Everything when it morphed out of being an adaptation and became something completely new. So I was attached to it all through that. Does that long involvement mean you feel more of an emotional connection with it than you would with a bigger film? When you get involved with something you put your heart and soul into it, so whether I’ve written it or it’s something I’m coming on board with, you tend to invest your entire self in it. So yes and no. I think because I’m a producer on this movie it does feel more personal. It was also a very personal experience for me as a performer as I had to give so much of myself. It wasn’t like I could rely on my fellow actors all the time. When I do Star Trek I’m part of a great ensemble and it’s really easy to just sit back and have fun with it because I’m surrounded by people all the time in scenes, whereas with this I spend a good deal of it by myself I have to carry it a little bit. The film has horrific elements and a lot of it very dark. Do you think in future you’d be interested in pursuing other roles that aren’t strictly comedic? I’m always just up for whatever’s good. I don’t specify what I want to do. I tend to get offered comedies because I’m known for them, but I’ve certainly done a lot of serious acting in my life that no-one ever saw − plays and things that I did when I was a student. My comedic reputation comes from the fact that I chose stand-up as an alternative to acting. Comedy’s my first love, but if you watch Shaun of the Dead or even Hot Fuzz we play it very straight all the time − it’s the situation that’s funny. I don’t distinguish between comedic and serious acting. Considering your career in America, do you think about where to base yourself? The thing about being in L.A. is that you’re in the very thick of the industry and that’s where everything tends to happen. You find yourself getting jobs at dinner, rather than having to go and make an effort to meet people. It’s the difference between being in the stream and being on the bank, basically. But the fact is that I could move to L.A. tomorrow and do my next three films here, so there’s no point for me, unless you’re working in television. At the moment I’m not interested in entering into the TV side of things, even though it seems to be where all the serious acting is at the moment. It’s become an incredibly auspicious thing, particularly American television, but it means that you play the same character every year for seven years and at the moment I want to mix it up a little bit more. So until then I’m very happy living in Hertfordshire. Is filming abroad difficult considering you have a family? I take them with me. Occasionally I have to be separate and that’s agonising, but thank you Facetime and Skype for easing that. Martin Freeman who’s currently doing the Hobbit put it very well, he said you’ve just got to do your time. There’s always small print, and in this job it’s sometimes having to be away from home, and having your privacy slightly impinged upon and all the trials and tribulations that being well known involves. It’s the hard part of the job, but I pay for the joy of doing something I love. Does it make you wary of another lengthy shoot? I always try and plan ahead. For Star Trek we all moved out to L.A. for six months. We got a nice house and lived on the west side and had a delightful time. My daughter’s American anyway because she was born there, so she got in easy. She had no trouble with immigration, it was me and my wife that had the problem − she sneaked us into the country.